The Ascension Quartet Announces two new members. Strafford, MO - As with most anything there are seasons of change. The Ascension Quartet has been in the midst of one of those seasons of change for the last month or so and while it's never fun to make changes (let's face it, none of us really like change), we're sad to announce the departures of Bruce Horton and Lathan Moore who have been a part of the group for 2 and 3 years respectively. We want to thank Bruce and Lathan for their time in ministry with the quartet. They've both been a huge part of the group and we wish them the best in all that they do. With their help, both of our last 2 singles made it into the Singing News Top 80 charts. As to the future, The Ascension Quartet is excited to announce our 2 newest members. The first person we'd like to introduce to you is our new lead singer, Chris Judy. Chris is no stranger to Southern Gospel music and has been singing all of his life in and around his hometown of Lebanon, MO it's only fitting that The Ascension Quartet should, again, have a member from Lebanon since the group started in Lebanon and was home to the quartet for several decades. Chris has been on stage with us a couple of times already and we're excited to get him out there with us all the time. Our second new member is also no stranger to Southern Gospel music. Matt Brooks hails from Rolla, MO but he started singing years ago in his home town of Salem, MO. He has previously sung with Second Coming from Salem, MO and The Heritage Boys from Rolla, MO. Matt is a graduate of the Steve Hurst School of music and we're excited for you to get to meet he and his wife Angela. Check our website for more biographical information on both Chris and Matt then come out to see us soon. We think you're gonna like what you hear. Check our schedule and come out to see us when you can. We'd love to see you. You can find more about Chris and Matt on our website by going to www.theascensionquartet.com. Franklin, TN - Mansion Entertainment has recently signed The Ascension Quartet to its roster of artists. The Missouri based group is comprised of Wayne Hughes (tenor), Lathan Moore (baritone), Bruce Horton (lead) and Walter Hayes (bass) and their debut project produced by Tony Griffith, 'Instrument of Grace', will be distributed through Sony RED and released nationally April 22, 2016. The debut single from the new project, "The Lord Knows What To Do", was written by popular songwriter Rodney Griffith and began arriving at Southern Gospel radio stations in March. Label manager John Mathis commented on the group's signing, "We have a recording studio at our facility and usually when someone is back there recording, it's business as usual for everyone. They're recording, we're doing our daily label functions up front. However, when The Ascension Quartet was recording their project I heard their vocals filtering down the hallway and had to go take a closer listen! These guys really have all the components that make up a great quartet. So we naturally wanted to partner with them and their future!" The Ascension Quartet Announces the selection of Bruce Horton as it's new Lead Singer. Strafford, MO - The Ascension Quartet's today announced the selection of Bruce Horton as it's new lead singer. Bruce is the son of a pastor and and has sung his whole life. We're excited to have him on board and can't wait for people to meet him. We think you'll agree that he was the right choice for this time in the ministry of The Ascension Quartet. Daryl Foster, Lead Singer for The Ascension departs to take pastorate. 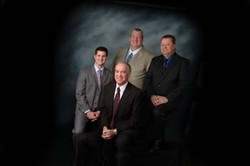 Strafford, MO - The Ascension Quartet's lead singer, Daryl Foster has decided to step away from the group and take the position of Pastor at Reeds Baptist Church in Reeds, MO. Daryl has sung lead for the group for the last 2 years and wrote four of the original songs on the group's last project "We're Gonna Walk Out". Daryl also played keyboards for the group. While The Ascension hates to lose a valued member we believe in Daryl and support his decision to follow God's will for this time in his life. We're very grateful to Daryl for giving his time and talent to the ministry of The Ascension Quartet. Strafford, MO – Ascension Gospel Quartet, Inc, under which The Ascension Quartet operates, today received the GuideStar Exchange Bronze participation level, a leading symbol of transparency and accountability provided by GuideStar USA, Inc., the premier source of nonprofit information. This level demonstrates The Ascension's deep commitment to nonprofit transparency and accountability. "We have worked hard to showcase our progress toward our mission, and our long-held belief in being transparent about our work, to our constituents," said Walter Hayes. "As a GuideStar Exchange participant, we use their platform to share a wealth of up-to-date information about our work to our supporters and GuideStar's immense online audience of nonprofits, grantmakers, individual donors, and the media." In order to be awarded the GuideStar Exchange logo, The Ascension had to fill out every required field of our nonprofit report page on www.guidestar.org for the Bronze level of participation. "I encourage you to check out our profile on GuideStar to see what we're all about," added Walter Hayes. "We are engaged in exciting initiatives, and we are thrilled to have another platform for communicating our advancement and progress." The Hyssongs are the guests on Gospel Music Today for the week of June 22. Ken and Jean Grady host southern gospel news and concert updates, the Feature Group is The Herb Henry Family, and Jean reviews new recordings by P.J. Anderson and Lineage of David. An article entitled "Front Porch Fellowship" is the subject of this week's Singing News Notes. The show includes the world wide debut of a new music video by Mark209, exclusive video of The Ascension Quartet, recorded by Gospel Music Today's cameras at the Ozark Gospel Music Convention, in Branson, MO, and a visit to the Gospel Music Today Archives for an exclusive concert video of The Freemans at the Southern Gospel Worship Gathering, in Broken Arrow, OK. The current edition of Gospel Music Today is online now at the Gospel Music Today website, www.gospelmusictoday.com. After 40 years the last founding member of The Ascension has decided to retire from the group. Danny has traveled many a mile over the last 40 years presenting the Gospel of Christ to a lost and dying world. He has been the go to person for all things concerning The Ascension for a number of years and has spent more time keeping the bus going than he'd probably want to admit. Danny told the group last year that he was wanting to start winding down and reminded us all of this earlier this year. Wayne Hughes and Walter Hayes have taken over managing the group and have stepped into the roles of CEO and President of the Ascension Gospel Quartet, Inc. which is the 501(c)3 non-profit company that The Ascension Quartet operates under. While we certainly hate to see him go, we understand his desire to want to spend a little time fishing and golfing among other things. We thank God for the legacy that Danny has left with The Ascension and pray God's richest blessings on Danny, Judy and Payton. The Ascension Quartet is pleased to announce that Lathan Moore of Springfield, Missouri has agreed to join the group. Lathan will be filling the baritone position and Wayne will be moving to the tenor spot with the departure of Jordan Palmer. Lathan Moore has been singing from as young as he can remember. As far back as setting on his mom's lap, learning the different parts to the old gospel hymns. Lathan grew up in a small coal mining community. His father to this day is still working in the mines after 43 years. This gave Lathan an appreciation for hard work and perseverance. After graduating from Harrisburg High School in 2000, Lathan joined a country Gospel Quartet called "Eastern Sky" to sing baritone and toured for two years throughout the Mid-East and Ohio Valley. Lathan also was a member of the Rliance Quartet from Paducah, Kentucky where he sang lead. Lathan recently sang with the Palmetto State Quartet and had the opportunity to open for the Gaither Vocal Band. While in College at Wayland Baptist University Lathan sang in a campus quartet with Paul Harkey who now sings bass with Ernie Haase and Signature Sound. Lathan and his wife Bethany now reside in Springfield, MO. We are excited to have them both as part of the family. Proving yet again is that the one constant in Gospel music, as in life, is change. We're sad to report that Jordan Palmer has decided to leave The Ascension. As you may remember Jordan and his wife Meredith had their first child last October. Jordan wants to be home with Meredith and baby Claire and we certainly understand that. We wish them both the absolute best as they go forward and thank them for the time and effort they gave to the ministry of The Ascension. Jordan and Meredith were great assets to the ministry of The Ascension and they will be missed but they're not leaving the family, just the ministry. We'll always consider them and others who have been part of The Ascension members of the ministry family. The Ascension Quartet is pleased to announce that Wayne Hughes of Strafford, Missouri has agreed to join the group. Wayne will be splitting time at the Baritone position with Danny Parnell and helping in other areas of the ministry. Wayne started singing gospel music as a child at the church where his father was song leader. He was saved as a young teenager and started singing in traveling groups at the age of 16yrs old. His call to this ministry comes from a lifelong desire to follow Christ and share His message of salvation and grace. Wayne lives in Strafford, MO with his wonderful wife Debi. They have 3 children. The Ascension announces the 2013 edition of the group. The Ascension features Jordan Palmer who has moved to the Tenor position, Danny Parnell who founded the group in 1973 will be singing Baritone. Walter Hayes joined the group singing Bass in October of 2012 and new to the group is Daryl Foster who will be singing Lead for the group. The Ascension looks forward to seeing you soon.